9. You don’t mind working 60 hours a week because you get to telecommute on Tuesdays and Thursdays. 10. In that photo of you on a tropical beach that’s hanging in your cubicle, you’re wearing a fanny pack. Or is that your mom? Either way, the neon one-piece is looking pretty hideous…and not in an ironic way. It’s about time for an updated family vacation photo. 11. You logged 40 hours on Kayak last month when you were supposed to be working. You’ve transformed the activity of airfare shopping into a neurotic obsession. “Wait, will it be cheaper if I connect through DFW instead of MIA?” “Prices might be lower if I search at 3am on a Tuesday!” Time to click “Purchase” already! 12. 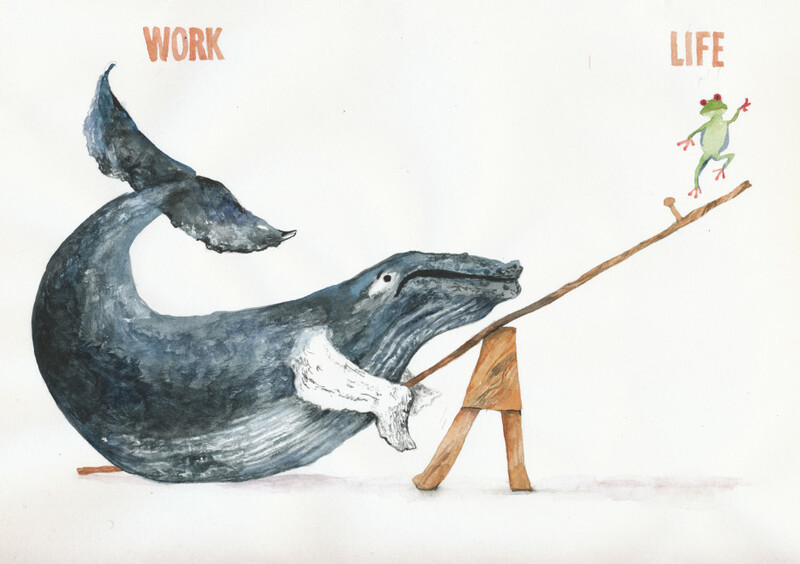 Your work/life balance is best graphically represented by a humpback whale and a red-eyed tree frog on a seesaw. 13. Your hiking boots have been swallowed by dust bunnies in the back of your closet. Your suitcases have become de facto junk drawers under your bed, and you can’t remember the last time you cracked open your once-prized travel journal. Step 1: Clean and declutter. Step 2: Book a ticket and go. 14. You’re unable to define pura vida, even though you speak fluent Spanish. There are only two explanations for this: 1) You’re not quite as fluent as you thought you were, or 2) You’ve never been to Costa Rica. Time to fix that, and learn what “pure life” is all about. 15. You can count workweeks like tree rings by measuring the depression worn into your office chair. The research does not pan out in your favor on this one, with recent studies correlating adverse health effects with overly sedentary (read: office worker) lifestyles, and suggesting that employees who fail to take time off can actually become less productive over time. It’s time to save the Americans! 16. Inner peace sounds more like the punchline of a joke than a legitimate state of being. That’s just a term people throw around, not something anyone actually feels, right? Sounds like you haven’t had enough yoga time on the beach lately. 17. You have nothing to contribute when the topic of travel comes up in conversation. Lisette went paragliding in Austria last month. Stefan is taking a month off to backpack around Central America. Caroline volunteers at a sea turtle conservation center every year. What do you have going on…reorganizing those sales databases yet again? 18. You’ve mistaken the concrete jungle for the actual jungle. No, that mound of dirt in the construction site on your way to work does not look like the Poás Volcano. And the morning fog in the suburbs (or is it smog?) bears no resemblance to the Monteverde Cloud Forest. 19. You’re worried about getting lost on the way to the airport. Remind me…where is that big place with all the planes coming and going? We have one of those here?